LULLABIES FOR ALL AGES! 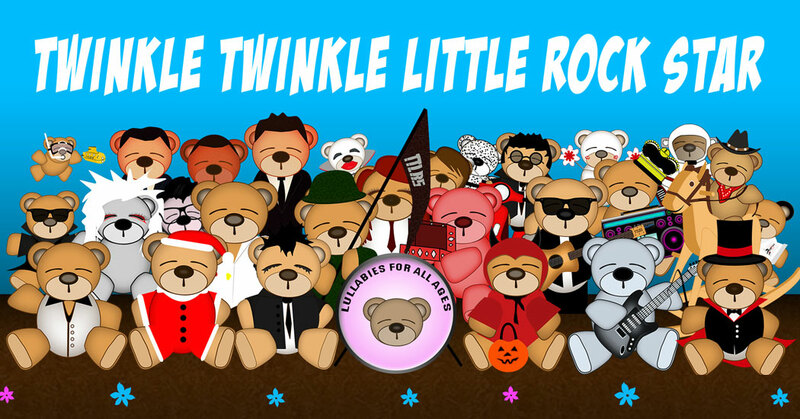 Twinkle Twinkle Little Rock Star creates beautiful lullaby versions of your favorite artists! Perfect for babies and parents, yoga, massage or relaxation. Twinkle Twinkle Little Rock Star was born for the parent that wants to pass along their biggest passion to their child, music. Twinkle Twinkle Little Rock Star transforms popular music into instrumental lullabies perfect for babies, yoga or just relaxation. Now, parents can enjoy the music from Lady GaGa to Metallica in soothing lullaby style. These aren’t novelty recordings. They are cute, they are soft but these are serious recordings. Roma Music Group, which releases Twinkle Twinkle Little Rock Star, puts the fidelity of these recordings at the top of the priority list. Let’s face it; much like the brand name clothes you buy for your infant, this music is really for you. Whether you are raising a metal baby, rocker or hippie baby, Twinkle Twinkle Little Rock Star has your music transformed from arena anthems into nursery classics. Roma Music Group, producers of TTLRS, is proud to be a green company. We offer CDs “on demand” through Amazon.com and digitally everywhere! No waste, just good taste (in music)! We are very proud to contribute to women and children charities such as House of Ruth. We offer parents our high quality products at an affordable price which we know from experience is important. TTLRS is the largest line of pop music lullabies in the world, with an incredibly diverse catalog of genres that includes Pop, Rock (classic and modern), Soundtracks, Country, Alternative, Metal, New Wave, Indie, Reggae/Ska, and Singer Songwriter.